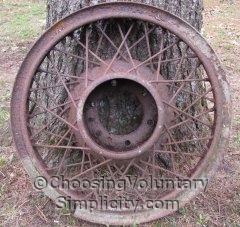 The wheel is covered with rust but otherwise seems to be in excellent condition. All of the spokes are intact and firmly attached. So what kind of wheel is it? I have no idea, but I would love to know the story behind the wheel being where it was… because there has never been anything except woods and a field in that entire area. A portion of our brook runs through an old lane on our property. At one time this lane was used as an alternative route from the road in front of where our house is now, across two large fields, and up to another road that runs parallel to the first road. Some of my older relatives could remember people driving their horses and buggies, and later an occasional car, through this lane. Midway through the lane there was a rustic stone bridge over the brook. Apparently this bridge wasn’t quite as long as it should have been, and in early spring or after a heavy rain the buggies and cars sometimes couldn’t make it through the mud at the back of this bridge. One story we heard many times was about a young fellow whose newly-purchased car became so badly stuck, it had to be pulled out of the muck with a team of horses. In the process, one of the wheels was removed and afterwards could never be found. At some point about sixty years ago the bridge supports (and the little bridge) collapsed, and it was no longer possible to drive over the brook. The largest stones are still there, still deeply embedded in the brook. They are much too large and much too heavy for us to move, but because these stones block portions of the brook, we have to periodically dig around them to make sure that the water is still running freely. Over the years we’ve moved a lot of smaller rocks out of this area, and that’s where many years ago we found the first wheel… several feet down, under rocks, and just in back of where the bridge used to be. The wheel is obviously old. 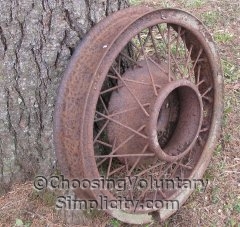 The rubber part is rock hard and the metal part is rusted, but the wheel is almost perfectly preserved. 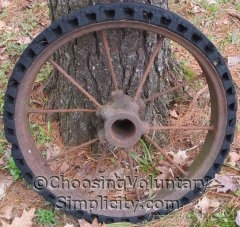 Is this perhaps the missing wheel that no one could find all those years ago? Or is it even a wheel from a car? Any old wheel experts out there? I’m no wheel expert but what a find these were, and to have them be in such wonderful condition too. The one with the rubber looks like images of early cars. The other one with all those spokes has to be really old too. Very interesting. We have rocky soil here too but unlike you we never find anything interesting. We’ve more or less given up trying to make our soil rock free but I have to say your dedication has inspired us to clear another section for a garden this year. Those wheels are amazing. What a discovery. Love the bridge story! I’m guessing that was the missing wheel. I’m with you in wondering how that first one got there though. Perhaps it was from some old farm machinery?